11 exemplary volunteers showed up at The Children’s Shelter Thrift Boutique in San Antonio, Texas on Saturday, July 21, 2018, to help give the thrift store’s exterior a new coat of paint. The roster of volunteers for the project filled quickly, as participants invited friends and relatives to be part of the event. Volunteers were set up with paint, rollers, and brushes. The revamped Thrift Boutique will help with sales efforts and continue to fulfill The Children’s Shelter mission to restore innocence and strengthen families, by providing affordable resale items for people in the community. Not only did QTC volunteers work on a Saturday, but they did so with a smile which exhibited a tremendous amount of selfless service. Thank you to all who participated in this great cause. 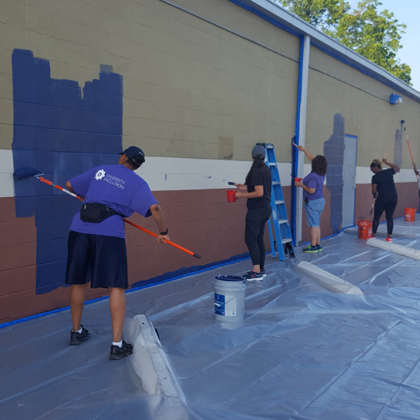 See other volunteer effort posts by QTC and learn more about how employees provide their time to support the local community.